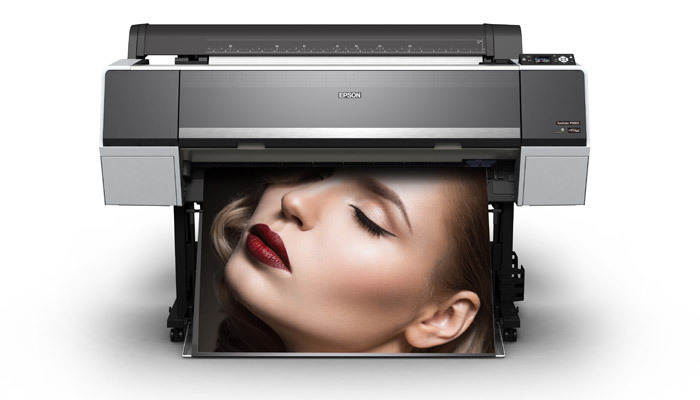 Earlier this month, Epson has announced its new SureColor P-Series line of large format commercial inkjet printers. It is represented with four gadgets (24-inch and 44-inch correspondingly): geared toward photographers and other creative professionals SureColor P6000 / P8000 and designed for high-end commercial purposes SureColor P7000 / P9000. The lineup excels previous models with even more advanced color gamut and provides printing on all possible types of media in roll or cut-sheet. The printers work with Epson UltraChrome HD and HDX inks with improved black density that’s 1.5x denser than previous ink formula. SC P6000 / P8000 use 8-color UltraChrome HD pigment-based ink set. SC P7000 / P9000—10-colour UltraChrome HDX ink set, incorporating a new violet ink (replaceable with a Light Light Black UltraChrome HDX ink) so that they can produce neutral black and white prints and a wide spectrum of colors achieving 99% of the Pantone color library. PrecisionCore TFP Printhead delivers ink through ink droplets as small as 3.5 picoliters providing ultra-high print quality. Other advantages include a built-in high speed rotary cutter, an optional 320 GB internal printer server and an optional SpectroProofer UVS in-line spectrophotometer for automated color management. The P6000 and P8000 models cost $2,995 and $4,995, the higher-end P7000 and P9000—$3,995 and $5,995, respectively, available in October-November 2015. This entry was posted on Tuesday, September 22nd, 2015 at 8:59 am	and is filed under Epson. "The Glowforge 3D Printer To Return The Admiration For Homemade Things [VIDEO]"